Jake Lehmann was leading Yorkshire's fight for survival at Headingley. Picture: Dave Williams. Jake Lehmann scored a magnificent century in a losing cause as Somerset overcame Yorkshire by ten wickets on the third day of the Specsavers County Championship match at Headingley. The hero for Somerset was left-arm spinner, Jack Leach, who bowled superbly to finish with figures of six for 64, while Lehmann moved his maiden Championship century on to 116 before he fell lbw to Leach, but by then Yorkshire had regained some of their pride by wiping out a first innings deficit of 245 runs. Lehmann was eighth out at 263, having batted for 287 minutes during which time he received 190 deliveries and struck a dozen elegant fours, and when the last wicket fell at 286 it left Somerset to make 42 to win which Marcus Trescothick managed between them without fuss. Their victory pulls them up to within one point of second-placed Yorkshire and both sides still have an outside chance of winning the title, but Middlesex remain the odds-on favourites. Yorkshire were already staring down the barrel when they resumed on 57 for three, still trailing by 188 runs, and although they never gave in it was not until Liam Plunkett joined Lehmann in an eighth wicket stand of 101 that an innings defeat looked as though it could be avoided. Adam Lyth was 27 overnight and Lehmann 15 and they took the score to 99 before Lyth got a faint touch down the legside off Craig Overton and was caught behind by Ryan Davies for 49. Leach, having earlier been given just one over, came back at the Football End and gained the first of his six consecutive victims as he drew Adil Rashid out of his crease with a cunningly flighted delivery which left him stranded and stumped. Lehmann completed his third half-century in as many matches but at 60 he enjoyed a life, Tom Abell putting down a bat-pad chance off the spinner. There was almost static support for Lehmann from Tim Bresnan whose only scoring shot off 51 deliveries was a boundary. He then played back to Leach and was bowled. Leach continued to make inroads, Hodd being seventh out when the Yorkshire wicket-keeper was caught off bat and pad by Abell, and with Lehmann on 71 with a further 83 required for Somerset to bat again the end did not seem far away, particularly when Plunkett was dropped behind the wicket before he had scored. But Plunkett defiantly on-drove Leach for six and Lehmann cantered to his maiden century for Yorkshire off 168 balls with 11 fours. He received the sort of ovation that was often reserved for his father, Darren, who plundered 26 centuries for his adopted county during the course of amassing 8,871 runs at an average of 68.76. Even the new ball had no effect, Plunkett going to his 50 shortly before tea when Yorkshire led by 11, but with the stand worth 101 Lehmann attempted a fine sweep at Leach and was lbw. Leach soon snared Jack Brooks and rounded things off by getting Plunkett caught at slip by Trescothick for a brave 73 off 146 balls with seven fours and two sixes, leaving Trescothick and Abell to knock off the runs for a surprising and thoroughly deserved victory. 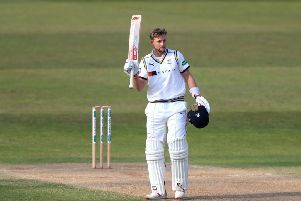 It was revealed after the match that Jake Lehmann will not play for Yorkshire against Middlesex at Lord’s next week because he has been called back to Australia by South Australia in preparation for the new domestic season and he will leave for home on Saturday. BAD START: Yorkshire's Andy Hodd is bowled by Somerset's Jim Allenby. Picture: Dave Williams. Lehmann said: “I am a bit disappointed to be going but cannot do much about it because the hierachy want me back. I would love to have been at Lord’s with the boys, I have really enjoyed the experience of being with them. Jack Leach said: “Obviously, this was a great result and I am very proud of the boys. I have been here at Headingley three times before and it has always been tough but we played them off the park in this game to get a good win. Yorkshire coach Jason Gillespie said: “I thought Jake was outstanding and played a fine hand but we need to improve our batting next season. When you are regularly 40 for three it puts you under the cosh and some solutions need to be found.